Ornithogalum umbellatum is a bulbous perennial with linear leaves and open heads of star-shaped white flowers with green undersides in spring. So far, so good. 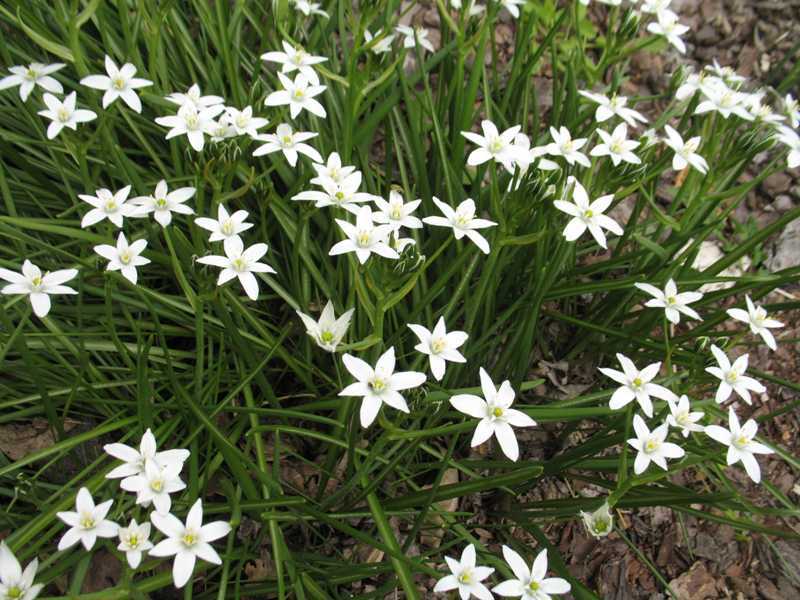 This member of the Star of Bethlehem family is often advertised as useful, clump forming, robust, effective at ground cover and sounds generally like a good all-rounder. In truth it is an insidious invader, growing by many tiny bulbils each year, muscling out any competition and forming dense mats of bulbs beneath and slim green leaves above the soil. Once it has a hold, it is a total pest to remove. Slugs won’t touch it, snails live in it and it resists being weeded out. Pull on the leaves and they break off, dig under and lift it out and tiny off-sets fly off in all directions to settle, root and colonise border, path and lawn alike. Once it gets mixed up with other plants in the border it is incredibly difficult to eradicate it. Last spring I filled two green rubbish bins with Ornithogalum umbellatum and this year it is back, as bad as ever. I have been reduced to spraying colonies in my own garden with Round Up to try to weaken them – sadly the effect has been minimal. Internet research shows that it is regarded as a pest in parts of the USA. If this does not convince you not to try it, it is also poisonous to dogs and humans. Other Ornithogalums are less thuggish but based on experience I would still be cautious about planting them.